...But what are the "Dueling Tampons"? And why the controversy? ...So what's the story behind our namesake, anyway? Since that's what this site is called, I figured I'd contact University Archives to get more of the details. 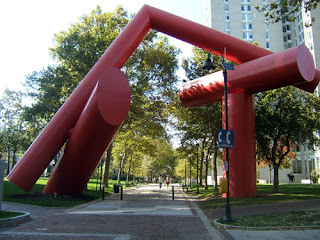 Beyond the fact that they're "four elements" made of rolled sheets of milled steel whose overall dimensions are 45' x 69' x 26'... the "Covenant" (real name) was something of controversy when it was built on Penn's campus in 1975. Click to check out more details about why this "obnoxiously spastic" (quote from a 1974 undergrad) structure was built in the first place. Now you (and I) know. Mark Cronin's (Eng'86) Rock of Love debuts this Sunday night! Tune in this Sunday, July 15 when Mark Cronin's (Eng'86, Mask and Wig) Rock of Love with Bret Michaels follows the lead singer of rock band Poison as he chooses a wife from a group of 25 young ("15 minutes of fame" craving) women. Check your local listings. Click here to see a commercial for Rock of Love! Check out this report I just saw about Penn getting into the crime prediction game. Todd Lieberman (C'95, Mask and Wig, AEPi) will be producing Traitor, an espionage thriller originally thought up by Steve Martin on the set of Todd's previously produced movie, Bringing Down the House. Per the Hollywood Reporter, "The story centers on a CIA operative working undercover with a terrorist group who becomes a terrorist suspect. [Don] Cheadle is the undercover agent, while [Guy] Pearce is an FBI agent investigating terrorist activities." Currently, Todd is in post-production on The Heaven Project, starring Paul Walker, and will begin shooting South of the Border on Monday for Disney. 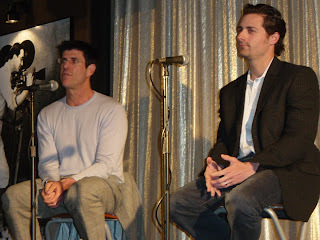 Finally set your tivos for Todd's TV show, The Kill Point coming to Spike TV on July 22. Elizabeth Banks (C'96) brings some holiday cheer to the silver screen this Christmas in the new Vince Vaughn film Fred Claus. Another day, another Entertainment job posting on DuelingTampons.com! This one's another goodie. 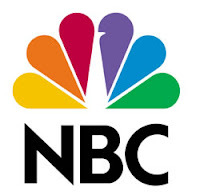 For all your Penn writers out there, this is a great opportunity to get your specs into the NBC writing program! For those of you who want to network with other ivy league alumni in entertainment, you should check this event out!